Veterans stand to be recognized as the Santa Fe Trail Junior High Choristers sing the anthems of each branch of the military Friday at Carbondale Attendance Center. 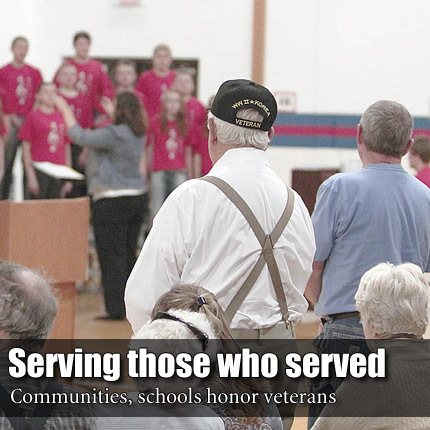 Osage County schools and communities marked the Veterans Day holiday with events throughout the weekend with meals, plays, assemblies and other events. Guest speaker at the Carbondale assembly was retired Chief Master Sargent Mac Criger, who honored those in attendance who served, including veterans of World War II, Korea, Vietnam, Desert Storm, Desert Shield and Afghanistan. “Each of those folks fought gallantly and did their jobs,” Criger said. Criger went on discuss patriotism, not only in those that served in the military, but those that serve their community – from his father to the handyman down the street. “If you work hard for your fellow Americans, support your community and family, I guarantee you, you’re a patriot,” Criger said. At Scranton Attendance Center, retired Sargent Harry W. Bryant spoke to the third- and fourth-grade classes, along with visiting guests and veterans. Bryant asked those in attendance to respect the flag and what it stands for. Ceremonies at both locations closed with a trumpet performance of Taps, honoring the veterans that didn’t make it home. Additional Veterans Day lunches and assemblies were held in Burlingame, Lyndon, Osage City and Quenemo.